1 license/50 States- 49 days paid time off annually! Grant/ Pendleton Counties, WV Community Based Outpatient Clinic seeks a Physician or mid-level provider to manage Veterans health through dedicated patient center aligned care; focus on health promotion and screening. This practice allows you 3 days in the gorgeous Grant County CBOC and 2 days in the newly built Pendleton County CBOC with a total panel size of 850 Veterans. The current staff consists of a physician, nurses, medical support staff, mental health providers plus access to Tele-Health (Mental Health, Podiatry, Retinal, Derm, Genomics, Pharm, and others). An opportunity to apply for Office of Rural Health (ORH) grant money and possibly work with students if so desired. Enjoy the stable work schedule Monday- Friday, 8am– 4:30pm. This affords you the opportunity to explore all the warmth and hospitality for which the Mountain State is known. We are located near the gorgeous Seneca Rocks State Park, the Timberline Four Season Resort(ski area in the Canaan Valley) and the wonderful West-Whitehill Winery. From pristine nature to vibrant Appalachian culture and abundant outdoor activities you can experience while having the work/ life balance you deserve. VA ensures and encourages a healthy work/life balance, and does so through predictable scheduling, reduced paperwork, the elimination of billing hassles, and lifting the burden of liability coverage. In addition, we also offer generous vacation and personal leave. It's these advantages that often prompt many experienced physicians to leave private practice, and come to work for the VA health care system. Able to perform general medicine, women’s health/pap smear. Full and unrestricted MD/DO license (from any state). 49 days paid time off annually! up to 5% matching funds on your 401(k); on average, federal government pays 75% of your premium on your health care insurance; possible annual performance bonus of 7.5% up to a max $15,000annually; VA contributes 9.6% of your salary toward federal retirement; and you do not have to pay a penny for malpractice insurance because you are covered by the federal government if a claim arises. Job Satisfaction: VA Physicians enjoy the luxury of practicing medicine with the latest technologies and do so with no overhead costs, staff to pay, no rent on a building and no filing insurance claims. A 40 hour work week makes this a dream job for a physician with lots of time off for family and friends. Located in the heart of West Virginia's Eastern Panhandle, the Martinsburg Veterans Affairs Medical Center (VAMC) can be found on 175 acres in historic Berkeley County and has a service area of more than 126,000 veterans in West Virginia, Maryland, Virginia, and Pennsylvania. The Medical Center, part of the VA Capitol Health Care Network (VISN 5), offers a comprehensive range of services, including internal medicine, ambulatory surgery, audiology and speech pathology, dental, nursing home, nutrition, podiatry, prosthetics, women's health, mental health and rehabilitation medicine. Patient care is provided through an integrated primary care concept, and each veteran is assigned to a team of health care providers that follows the patient's care both as an inpatient and an outpatient. 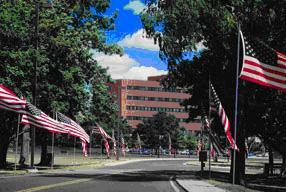 It is the mission of the Medical Center to honor America's Veterans as heroes by providing the highest quality health care. The employees of the Martinsburg VAMC are dedicated to improving the quality of life for eligible veterans through excellent health care.